After an uncharacteristic absence of volatility in 2017, its return to the U.S. stock markets unnerved many investors in 2018. We expect much of the same this year. When downward trends emerge, it’s natural to want to sell investments that are falling to park your portfolio in cash until things calm down. But letting anxiety be your broker can mean you miss the market’s inevitable rebounds. At Adviser Investments, we know that learning how to manage your emotions in up-and-down markets is the key to long-term success. In this exclusive special report, we distill our philosophy for navigating rough markets into five key steps. Armed with the knowledge and confidence to make wise decisions during periods of market volatility, you will be to find opportunity in the markets. It’s never too soon to be a more informed investor—especially when markets are unsteady. Complete the form on this page to receive this free, no-obligation report today! A copy of The 5 Steps to Thriving in Volatile Markets was sent to the email address you provided. Also, a copy of The 5 Steps to Thriving in Volatile Markets has been sent to the email address you provided. Whenever the U.S. stock market hits a rough patch, it’s hard to escape the relentless reports of doom and gloom. Turn on the television or radio, or surf the web and you’re confronted with worrisome headlines that bemoan every dip and dive in the markets. The constant drone of bad news, stoked by an endless 24-hour news cycle, creates a high level of worry and anxiety that is simply hard to withstand. Once such force-fed fear sets in, it’s natural to want to sell your investments that are declining in value and park your portfolio in “risk-free” money markets. But if you pull out of stocks when they are falling, you put yourself in the cross-hairs of another risk: Being left behind when the markets inevitably rebound. At Adviser Investments, we recognize that sitting tight and “staying the course” is far easier said than done. We also know that learning how to manage your emotions in rough markets is the key to long-term success. We want to share evidence that will help you practice one of the most important investing rules: Patience, not panic, wins the day. We have distilled our philosophy for navigating rough markets into five key steps. Knowing how wealth is created over the long-term will give you the confidence and insight to make wise decisions during periods of market volatility. In a perfect world, we would all possess a crystal ball that would tell us when to get out of stocks before a market correction, and when to buy stocks ahead of a bull run. Unfortunately, no such mechanism exists. Sure, there’s always someone out there who manages to make one nice market call. But the problem is that one right move isn’t enough. Even if you manage to make the right call and exit the stock market before a major decline, your work is just half done. You need to get your money back into the stock market before the next rebound if you want a shot at inflation-beating gains. It is hard enough to make one right market call; making two is even more elusive. In the 40 years through 2018, the S&P 500 stock index had an annualized gain of 11.5%. Yet, the average stock fund investor earned returns significantly less than that. Investors’ main weakness? Bad timing that kept them out of the market for just a few critical days here and there. It takes very few missed days to sabotage a portfolio. 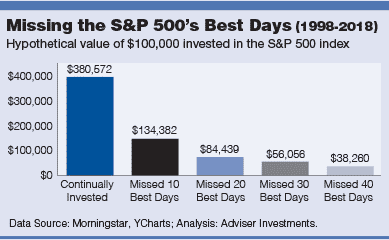 As the chart below illustrates, being out of the market for the 10 best days over the past 20 years resulted in a return that was more than 50% less than the gain from staying fully invested during that stretch. 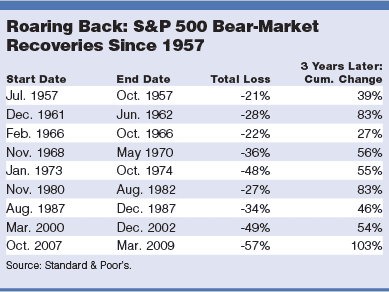 Those that missed greater numbers of the best days saw their returns suffer even more. That’s one of the reasons why Adviser Investments believes in time in the market, not market timing. We are confident that by remaining patiently invested in tough times we keep our portfolios positioned to do well when the markets do well. When stocks hit a down period, the safety of bank certificates of deposit (CDs) and money market accounts look more attractive. Who wouldn’t prefer having their money in cash investments where there is virtually no risk? That’s why Adviser Investments recommends you keep a portion of your portfolio in cash. This way, you know you will always have a backup fund to cover emergencies or unexpected expenses. But beyond your emergency stash, having too much cash in your long-term investment portfolio can hurt returns. It also adds another kind of risk: Historically, cash has failed to keep pace with inflation. Over the past 40 years, the average annualized gain of a 3-month U.S. Treasury bill—a good proxy for cash—was just 1.4 percentage points more than the 3.3% rate of inflation. And that’s before taking taxes into account. Assuming that you paid a 25% tax on your income, that 4.7% return falls to 3.525%—putting you just 0.225% ahead of inflation on an annualized basis. At the top federal tax rate of 37%, you would have actually fallen behind inflation each year. If your goal is to generate inflation-beating returns (and it typically is the goal for most investors), cash is not the answer. Stocks are still your best bet. Over long periods, stocks have produced returns more than double those earned by cash. Moreover, current tax law levies a top capital gains tax rate of 20% on investments held more than one year. For high-income investors, that’s a lot better than the 37% tax charged on cash holdings. Now of course we all know that stocks do not go up every year. There are months, and even years in which stocks lose value. Still, remember that despite periods of major declines during the past 40 years, the S&P 500’s long-term annualized gain was 11.5%. If you managed to sit tight throughout the volatile markets, you were rewarded with an annualized gain that significantly outpaced inflation and cash. That’s why Adviser Investments believes stock funds are a critical component in the portfolios we build to help our clients meet their long-term investing goals. Adviser Investments’ confidence in stocks over the long term stems from our core discipline of managing market risk. Reducing losses by actively managing risk improves long-term performance for our clients. We recognize that we can’t avoid losses entirely. But our goal is to keep losses within a reasonable framework so that when markets rebound, we recover those losses quicker, moving on to further gains ahead of broad-based market indexes. We like to say that there is tyranny in the mathematics of loss: Lose 10% and you need only an 11% gain to get even; lose 20% and you need a 25% gain. But lose 50%, as many index investors did during the 2007–2009 bear market, and you need to double your remaining assets to get back to where you were. It took the S&P 500 index, with dividends reinvested, almost four years to recover the losses suffered in the 2007–2009 bear market. A 100% stock portfolio gained 11.5% on an annualized basis over the 40 years through 2018; during that stretch there were seven years where the portfolio lost value. The worst calendar-year drop was a 37.0% loss. A portfolio that invested 80% in stocks and 20% in bonds posted a 10.9% annualized return. In seven down years, the single worst annual loss was a 28.6% decline. Increasing the bond portion to 30% (70% stocks) produced a 10.6% annual return and in six down years, the worst year was a 24.3% loss. Geographic Diversification: Fewer than half of the public stocks traded worldwide are based in the U.S. Moreover, the U.S. economy does not move in lockstep with foreign economies; when there is a recession here, a foreign economy—and its markets—may be doing quite well. Investing around the globe gives your portfolio exposure to stocks and economies beyond the United States. Style, Size and Market-Segment Diversification: References to a singular “market” belie the fact that the stock and bond markets are in fact comprised of many distinct parts that do not move in sync with one another. Growth stocks behave differently from value stocks. Large-cap stocks and small-cap stocks each have their own characteristics. Each stock falls into one of dozens of industry and sector classifications; each industry reacts differently to market and economic conditions. Within the bond universe, investment choices vary y issuer (federal government, municipal, corporate), maturity (short-term, medium-term and long-term) and credit quality (investment-grade to junk). Spreading a portfolio among the different segments of the stock and bond markets provides more diversification than a portfolio focused on just one or two areas. Making money in bull markets is relatively easy. Making money over an entire economic cycle of both up and down markets tests every manager’s talent. Adviser Investments invests with managers who have a proven record of producing strong risk-adjusted performance over a full market cycle. Our emphasis on the manager, not the fund, is so fundamental to our investment philosophy that we trademarked it! 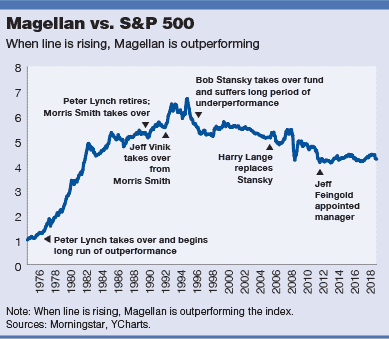 As you know, managers come and go from a fund—just look at the record for Fidelity Magellan above. Adviser Investments’ in-depth research helps us identify managers’ track records, no matter which fund they’re running. This takes much of the guesswork out of buying funds or finding the best substitute for a closed fund. We also personally interview fund managers so we can get a solid sense of their investment philosophy. It is always a plus when we find a manager who has some of his or her own money invested in the fund. When managers are also fund shareholders, it gives us extra confidence that they are highly motivated to do well. The challenge in volatile markets is to resist the urge to make portfolio decisions that calm your nerves in the short-term but prohibit you from achieving your long-term objectives. That’s where an independent, fee-only investment adviser that gets paid to provide advice that is in your best interest—not to sell you something new—can provide tremendous value. Being able to pick up the phone or send an email to share your concerns and get professional advice is one of the best remedies for remaining informed and calm while others are overreacting to a falling stock market. A telltale sign of a quality adviser is a talent for listening. A good adviser doesn’t automatically tell you not to worry when the markets are falling, or insult you with cookie-cutter advice. A top-notch adviser takes the time to find out exactly what you are worried about and then addresses your specific concerns. Ideally, that two-way communication is the cornerstone of your relationship with an adviser, no matter what the current conditions of the markets are. It starts with the first conversation. You want to work with an adviser who wants to know about you and your life goals. That is the only way to devise, and stay with, an investment plan that best serves your specific needs. Download your free copy of The 5 Steps to Thriving in Volatile Markets now!